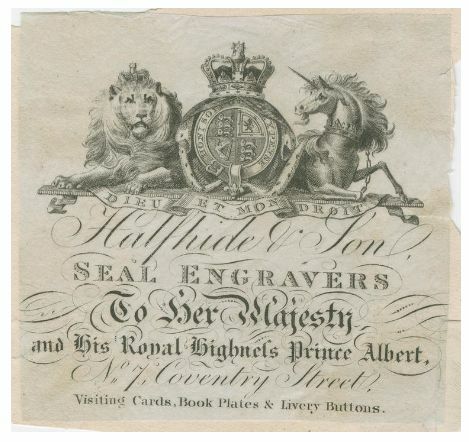 From 1784 to 1796, one John Barnes had his seal engraving business in Leicester Fields, and from 1796 to 1799 at that address together with George Halfhide, but in 1800, they relocated the business to 7 Coventry Street. Not long after that, Halfhide continued on his own, often referring to himself as the successor to John Barnes. What happened to John Barnes is unclear; he may have retired, moved away, or died. Nor is it clear what exactly the relationship was between the two men. Was Halfhide an apprentice to Barnes who stayed on at the end of his apprenticeship to become a partner, or was Barnes at some point in need of money and looking for a partner? 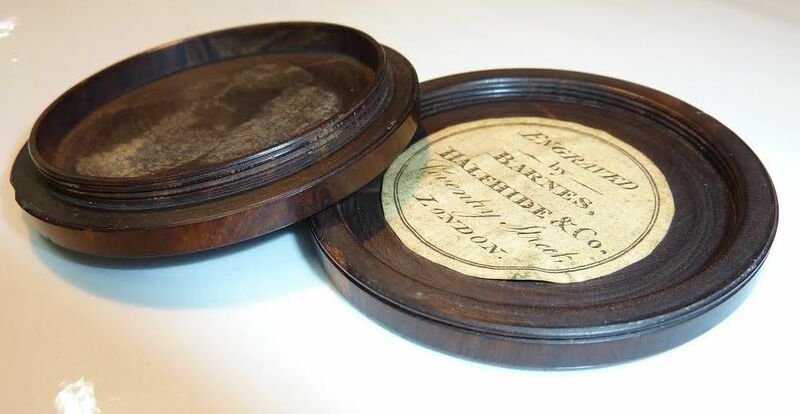 Whatever the reason for their partnership, it certainly made Halfhide into a well-established seal engraver with official appointments. 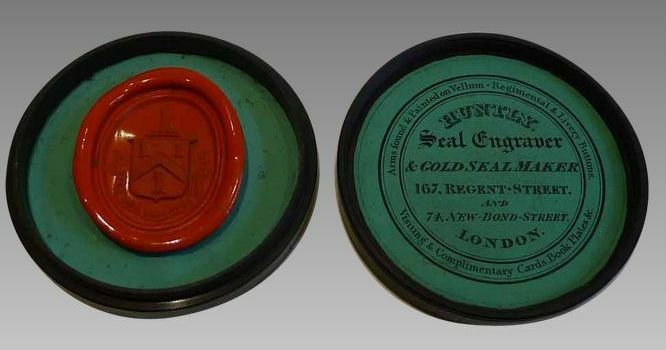 At one time or another in the first twenty years of his career, he was the official seal engraver to the Prince of Wales and the Dukes of York, Cumberland and Sussex. 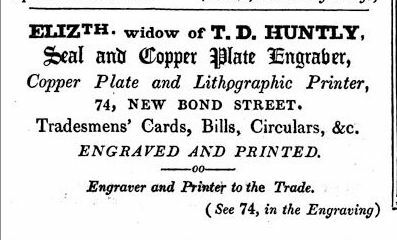 Later in his career he was also the official engraver to Queen Victoria and Prince Albert; appointments he proudly announced on his trade cards. But engraving seals was not all Halfhide did. 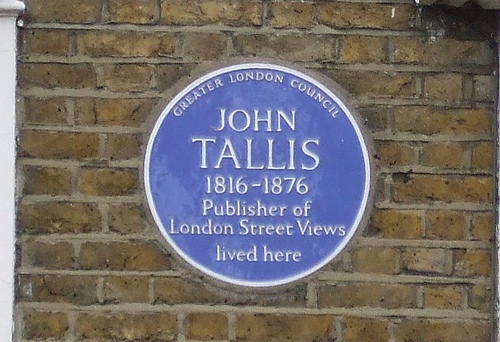 On two of his cards, he also advertises visiting cards, bookplates and livery buttons. Of the latter, I have not found examples [UPDATE: another kind reader sent me pictures of a button], but of the visiting cards and bookplates we can find evidence in the correspondence of two men. 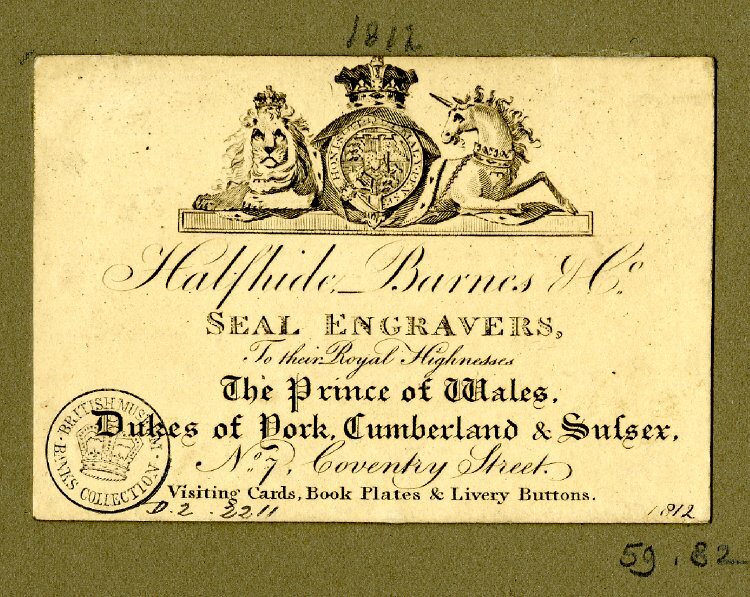 And although these bookplates and cards no doubt brought in welcome monetary resources, Halfhide was first and foremost a seal engraver and several of his seals still exist. The National Trust owns one in their collection at Smallhythe Place, Kent (photo here) and one for George Murray, Bishop of Sodor and Mann came up recently in an auction (photo here). A nice example is the one for St. David’s College at Lampeter which was founded in 1822 and is now part of the University of Wales, Trinity Saint David. Not an awful lot is know about Halfhide himself. At some point, his son, another George, became part of the business, from then on referred to as Halfhide & Son. George senior’s will has been transcribed in full (see here) and in it he mentioned that he is formerly of Coventry Street and now of Southend Lewisham. 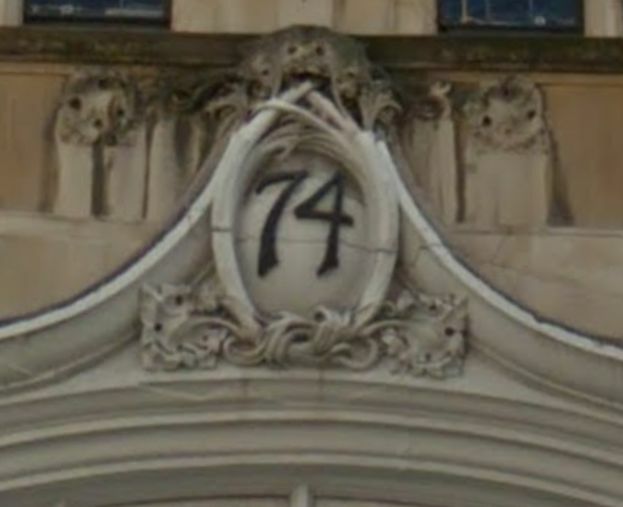 This is also born out by the 1841 census when both George senior and George junior are listed at Clear Lodge, Perry Hill, Lewisham. Also living there, besides a number of servants, is Mary, junior’s wife. Mary was the daughter of William Clowes, the printer. (4) There do not seem to have been any children for George and Mary, at least, none are mentioned in the censuses of 1841 and 1851. George junior died 10 June 1860(5) and his first probate record on 6 July 1860 lists William Nash, seedsman, and Edward Clowes, Esq. (brother-in-law) as two of the executors. 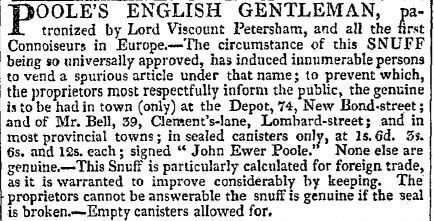 The third executor, Samuel Snell, wine merchant, gave his oath to the proceedings on 16 May 1861. Why the delay is unclear. A hand-written addition to the first record of 1860 changes the original estimate of £12,000 to £14,000 with a date of March 1866. 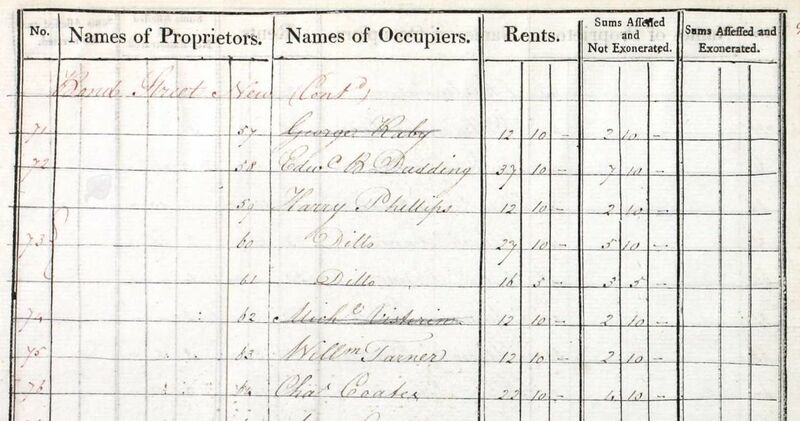 The 1861 census gives the widow as “proprietor of houses, fund holder”, still living at 7 Coventry Street. The Gentleman’s Magazine of 1865 gives Mary’s death on 19 April, but her probate record correctly gives a date of 3 January. (6) The executors of her estate are George and Edward Clowes, her brothers. 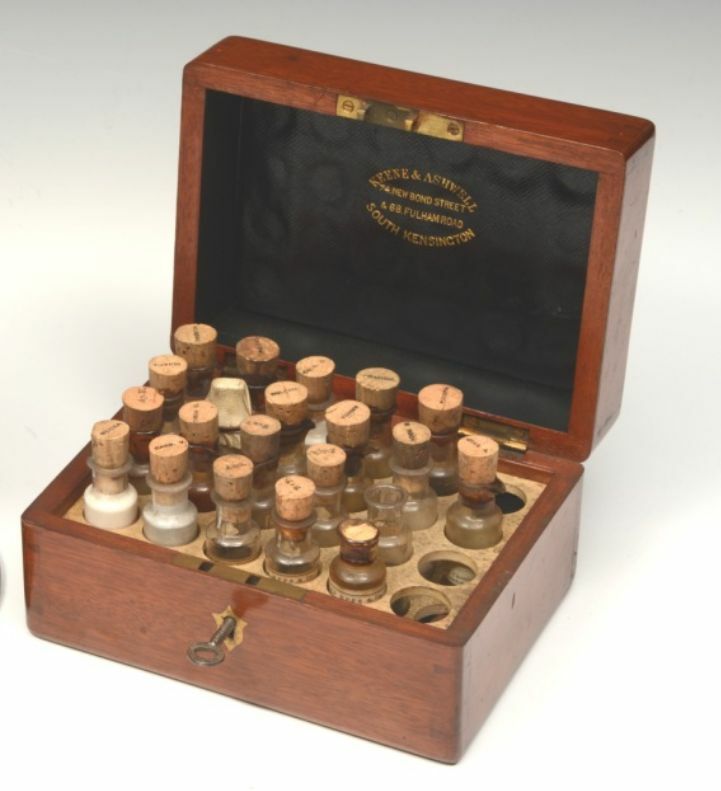 The original value estimate for her estate of £5,000 is changed to £3,000 when the case is resworn at the Stamp Office in January 1866. (7) But even as late as 1870, the finances of the deceased couple had not been finally arranged as a notice appeared in The London Gazette of 25 October of that year that “all creditors and other persons having any claims or demands upon or against the estate” are required to make themselves known to the solicitor for the executors. What became of the shop and the seal engraving business is unclear, but near the end of his life, Halfhide must have entered into a partnership with one Standish as in early 1865, the University of Mumbai placed an order with “Messrs Halfhide and Standish, Seal Engravers, London, for engraving a common seal for the University with the arms granted by the Earl Marshal. 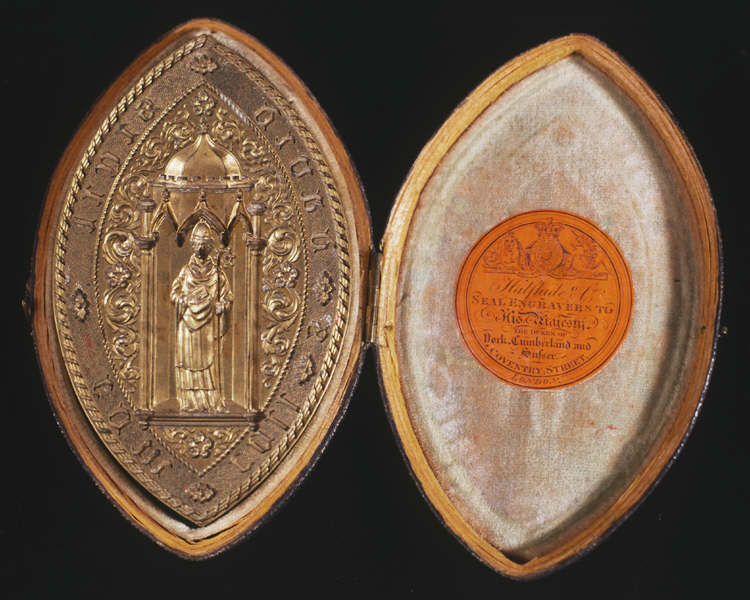 The seal was to be of silver with an ivory handle, and the engravers were asked to take instructions from the University’s agents in England”. 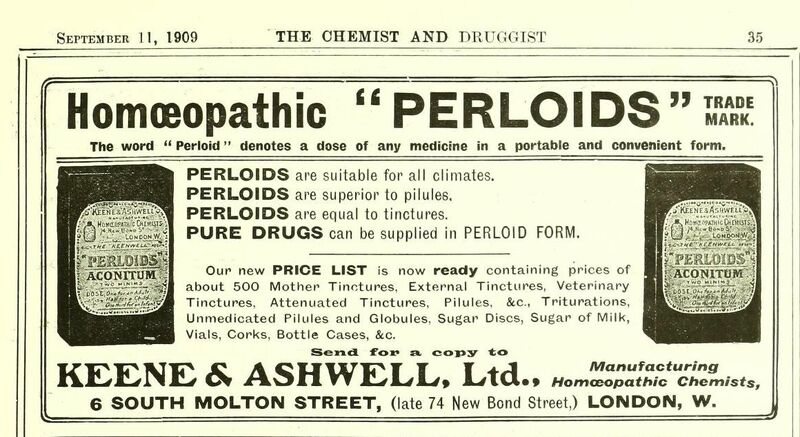 (8) But that is as far as my information on Standish goes, although a trip to the Bodleian may be useful as they have “an album with samples, mainly printed by Halfhide and Standish”. Postscript: As you can see from the comment on this post, Sam Pisano found a wonderful piece of evidence to supplement the information we have on George Halfhide. 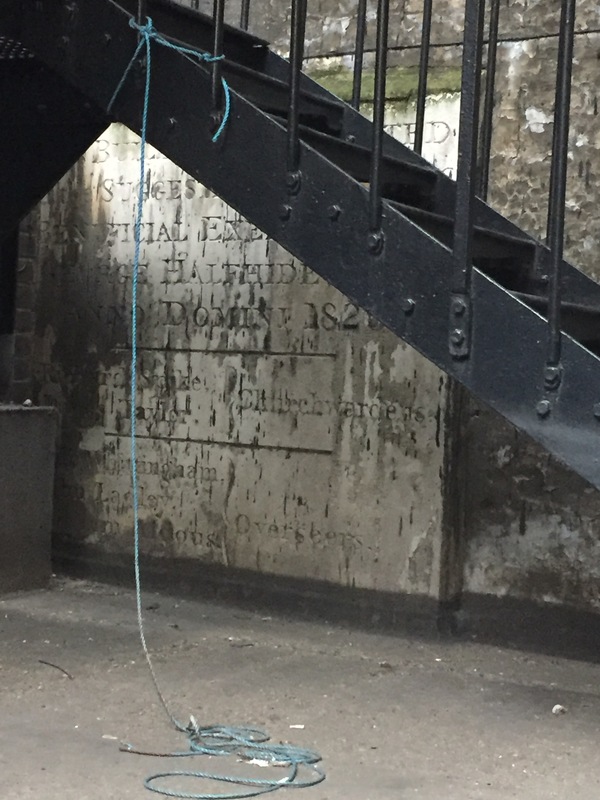 Hidden behind a fire escape is a stone plaque showing that the building “was erected at the suggestion & unceasing beneficial exertions of George Halfhide”. The plaque is situated on a piece of wall, apparently all that’s left of the building it once graced, in a courtyard between Poland Street and Marshall Street. 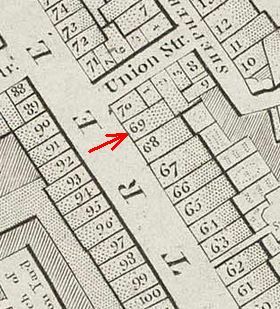 In 1725, the parish of St. James, Piccadilly, erected a workhouse in Poland Street, eventually covering the area between Poland Street, Marshall Street and Great Marlborough Street. The workhouse was extended and modified several times, extensively so in 1821. 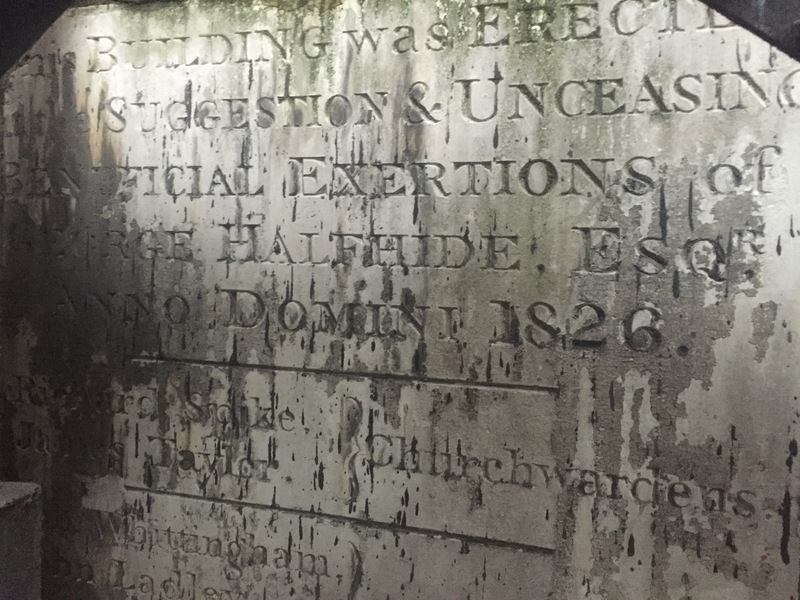 Whether the date on Halfhide’s stone memorial, 1826, points towards another extension or whether the building had been erected earlier and the year just dates the erection of the plaque is uncertain. Nor have I found out which part of the workhouse Halfhide helped to build, but if further research leads to more details, I will let you know. 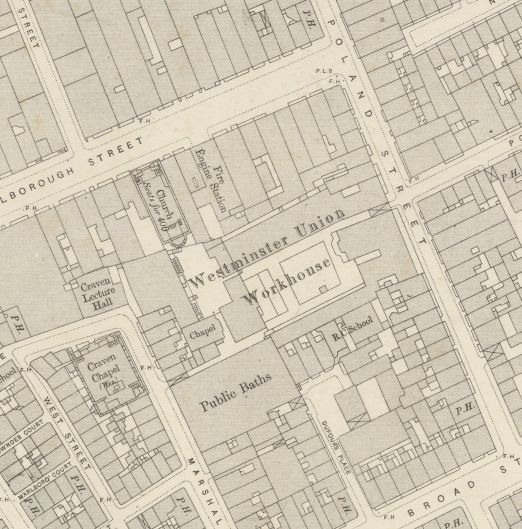 The workhouse itself became an important part of John Snow’s investigation into the cause of cholera as he noticed that, although the workhouse was situated quite close to the Broad Street pump, which he had thought to be contaminated, only a few of the inmates contracted the disease. The workhouse had its own well, however, so had no need to get its water from the pump, providing Snow with another piece of evidence to point to the water from the pump as the problem. As we now know, he was quite correct, but many did not believe him at first, causing a delay that led to many more unnecessary deaths. 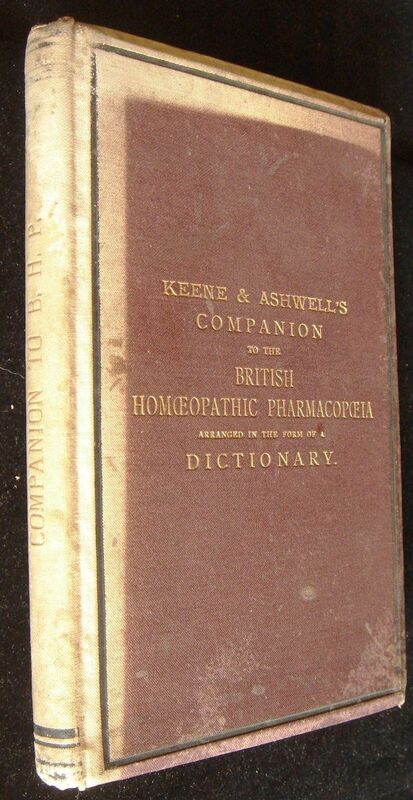 (1) John Rylands University Library, Manchester: GB 113 EGR4/2/12/8. Letter dated 23 October 1822. (2) The Correspondence of William Henry Fox Talbot: Letter dated 17 September 1827 (transcription from http://foxtalbot.dmu.ac.uk/ Original letter in the British Library). Mr. F. is Rear Admiral Charles Feilding (1780-1837) of the Royal Navy and Talbot’s step-father. (3) The Correspondence of William Henry Fox Talbot: Letter dated 8 February 1830 (transcription from http://foxtalbot.dmu.ac.uk/ Original letter in the British Library). 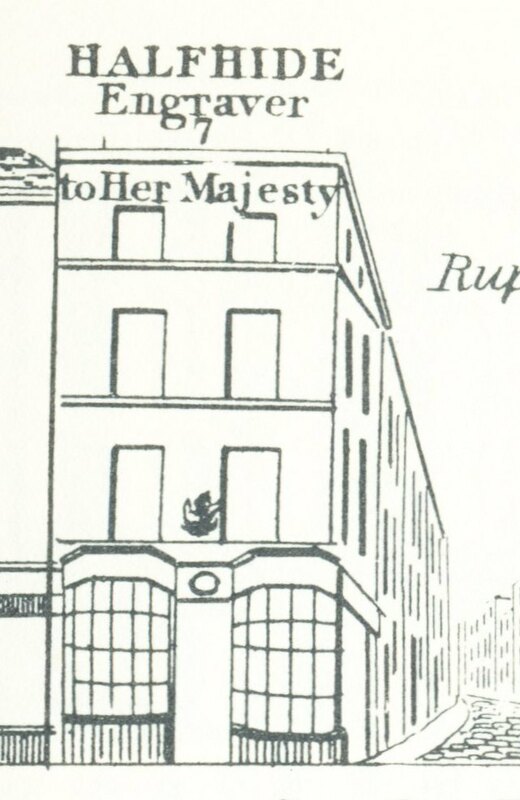 (4) They were married on the 9th of July, 1829 at St. Margaret’s, Westminster. (5) He was buried at Norwood Cemetery on 16 June 1860. (6) She was buried at Norwood Cemetery on 10 January 1865. (7) England & Wales, National Probate Calendar (Index of Wills and Administrations), 1860, 1861 and 1865. (1984, 2nd. ed. 2006), p. 153-154.